Thanks as usual to a great readership we destroyed the Kingman Kontroversy in a matter of hours and moved on to still more mystery. First up, on the right is a 1981 program showing a spring training photo of Dave Kingman (wearing No. 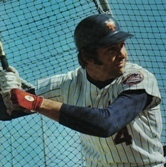 5, obscured by his bat) along with Rusty Staub. Both TommieCleon and SJR provided me with this image — apparently published at least twice that season (once pre-strike, once post-strike). On the left is a weird All-Star insert card provided by TommieCleon, also showing Kong with the partially obscured No. 5. As detailed in the comments in the post below this, this controversy reminded me of another “false positive” Kingman spring. This one was 1975. Tonight I cracked open the ’75 yearbook to find the below photo, showing the newly acquired Kingman in a St. Petersburg batting cage wearing No. 4 but with a roster, dated March 27, noting Kingman would wear 26 once the season began. 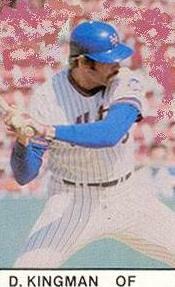 Adding to this confusion were photos of Rusty Staub also wearing 4 — but they dated to 1974. Staub that spring was wearing 10 for the first time — he’d ditched 4 after Duffy Dyer was traded that winter. Now things get really weird. When that 1975 season finally began, it was April 8, a Tuesday day game against the Phillies — 33 years ago today. I was at Shea with my Dad, and Kingman hit a home run. We won 2-1 that day as Seaver outdueled Carlton. Tonight I learned that today’s disappointing home opener against the Phillies was attended by Dave Kingman. * Before today’s game, Matt Wise was placed on the disabled list with a stiff forearm. The surprise recallee, Carlos Muniz, pitched this after noon wearing No. 32. Muniz wore 38 last year before Wise arrived this winter.